There is a common adage that owners with obese dogs or cats are “loving their pets to death”. And this can be taken quite literally. The extra treats or the table scraps could very well be pushing your pet towards the grave. Overweight cats are at an increased risk of arthritis, urinary tract infections, liver disease and skin disease, whilst overweight dogs are at a higher risk of joint disease, mammary tumours, and pancreatitis. 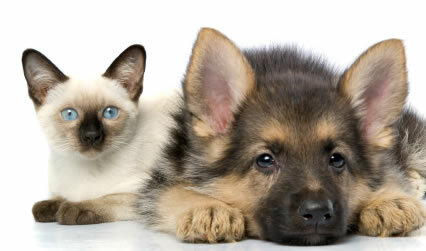 Furthermore, dogs and cats that are their ideal weight actually live for years beyond their overweight friends. If your dog or cat is overweight it is recommended that you see your local veterinarian to determine your pet’s ideal weight and develop a weight loss program. Exercise is always part of the weight loss equation. For dogs this can mean going for walks or even just throwing a tennis ball. For cats this can mean chasing a ball of paper or playing with a toy on the end of a rope. Although exercise is a key component to weight loss it is often your pet’s diet that will have the greatest impact on their weight. There are two ways the diet can be altered – either by reducing the amount of their current feed or by changing them to a feed that is specifically designed for weight loss. The latter option is recommended as these feeds not only have lower calories but have higher fibre so that your pet gets a feeling of being full. There are a variety of weight loss diets on the market, such as Science Diet Light or the prescription diet Hills r/d. A significant factor that will counter your weight loss efforts are those loving treats and table scraps so many of us like to give. Instead of showing your pet how much you love them with treats, rather reward them with a toy or affection. Prevention of obesity is the best cure. Firstly, don’t feed your pet ad lib. Determine the amount of feed your pet actually requires per day and split this into two feeds for morning and night. Secondly, ensure you are feeding the right food for your pet’s life stage, as well as matching the feed to their energy level. A puppy needs more energy in their diet than an adult, and a working dog will need more energy than a lap dog. Lastly, before purchasing a new puppy do some research into which dog will suit your lifestyle. Labradors, for example, are prone to obesity and thus require time and effort in exercising. So instead of loving your pet to death, why not show them how much you love them by ensuring they are around for as long as possible by avoiding the nasty health problems associated with obesity. Please do not hesitate to contact us on 3202 7300 if you have any pet related questions or concerns.